The Atlantic County Firefighters' Association of the State of New Jersey, Inc. has unified the entire fire service community of Atlantic County, New Jersey since its inception in 1923. While firefighting has certainly changed dramatically over the years, the Association's three original goals/objectives have consistently served as the backbone of the organization and continue to hold true today. Most of the fire service organizations in Atlantic County are members of the Association. This includes career and volunteer departments. The official motto of the Association is "In Union for the Safety of All". When - Annually at the April Meeting of the Association - 2019 Deadline for submission is March 1st. Valor Award nominations need to be submitted via application. Click here for application. Submissions for recognition of 50+ Years of Service may be sent on department letterhead, or via email, by a Chief or President of a department. The Atlantic County Firefighters’ Association recognizes that vendor presentations can provide useful educational and research materials that could be a learning experience that allows for the evaluation of products, devices and services, and the possibility of learning new techniques. However, there must be guidelines for programs presented by persons who have a financial interest in products or procedures they discuss. Any vendor making a presentation at a meeting of the Atlantic County Firefighters’ Association must have an invitation from a member who should first seek the approval of the President and Chair of the Executive Committee, or assigned designees. The presentation must be related to the missions of the Atlantic County Firefighters’ Association or the well-being of the association members. Any members that have a financial relationship with the vendor must disclose that relationship prior to the presentation. Someone is fraudulently soliciting donations on behalf of the Atlantic County Firefighters’ Association and/or an unnamed burn foundation using the Atlantic County Firefighters’ Association name. The Atlantic County Firefighters’ Association does not use telemarketers to raise funds for either association use or on behalf of any other group, such as a burn foundation. The association does not solicit donations over the phone or by canvassing door-to-door. The public should report suspicious activities and fraudulent phone calls to their local police department. The New Jersey Division of Fire Safety has issued a Security Alert about unauthorized solicitation. Read it here. All Web site design, text, graphics, the selection and arrangement thereof, and all software are property of Atlantic County Firefighter's Association of the State of New Jersey, Inc. Permission is granted to electronically copy and to print in hardcopy portions of this Web site for the sole purpose of interacting with Atlantic County Firefighter's Association of the State of New Jersey, Inc. and any of its affiliates and for using this Internet promotion as an informational resource. 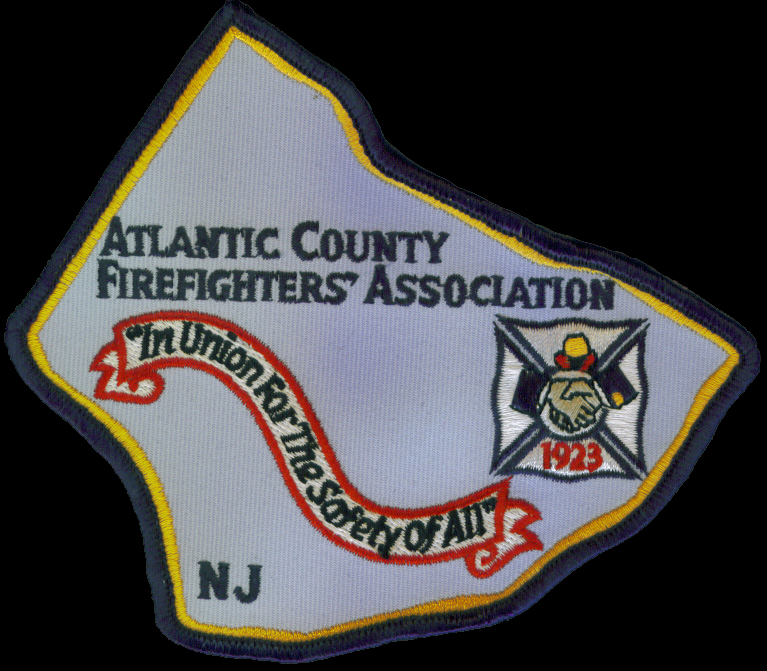 Any other use of the materials on this Web site, including reproduction for purposes other than those noted above, modification, distribution, or republication without the prior written permission from Atlantic County Firefighter's Association of the State of New Jersey, Inc. is strictly prohibited. Atlantic County Firefighter's Association of the State of New Jersey, Inc. and www.atlanticcountyfireassoc.org are Trademarked. All other trademarks, product names and company names or logos cited herein are the property of their respective owners. ATLANTIC COUNTY FIREFIGHTER'S ASSOCIATION OF THE STATE OF NEW JERSEY, INC. IS PROVIDING THIS SITE AND ITS CONTENTS ON AN "AS IS" BASIS AND MAKES NO REPRESENTATIONS OR WARRANTIES OF ANY KIND WITH RESPECT TO THIS SITE OR ITS CONTENTS. ATLANTIC COUNTY FIREFIGHTER'S ASSOCIATION OF THE STATE OF NEW JERSEY, INC. DISCLAIMS ALL SUCH REPRESENTATIONS AND WARRANTIES, INCLUDING FOR EXAMPLE WARRANTIES OF MERCHANTABILITY AND FITNESS FOR A PARTICULAR PURPOSE. IN ADDITION, ATLANTIC COUNTY FIREFIGHTER'S ASSOCIATION OF THE STATE OF NEW JERSEY, INC. DOES NOT REPRESENT OR WARRANT THAT THE INFORMATION ACCESSIBLE VIA THIS SITE IS ACCURATE, COMPLETE OR CURRENT. Except as specifically stated on this site, neither Atlantic County Firefighter's Association of the State of New Jersey, Inc. nor any of its directors, officers, employees, or other representatives will be liable for damages arising out of or in connection with the use of this site. Users specifically agree that Atlantic County Firefighter's Association of the State of New Jersey, Inc. shall not be responsible for unauthorized access to or alteration of your transmissions or data, any material or data sent or received or not sent or received, or any transactions entered into through this service. Atlantic County Firefighter's Association of the State of New Jersey, Inc. does not give, sell or transfer personal information to third parties, unless required by law. Some images throughout this site have been licensed to Photographer Dennis Sharpe. These images are not to be downloaded for reuse or any other purpose.